Instead of buying a push mower in 2018, choosing a lawn mower rental service is also a good solution if you want to take care of your garden. In this article, we would like to introduce you to the way to rent a suitable lawn mower, as well as where can you rent a lawn mower for yourself. Why do we need to rent a lawn mower? If you have a large yard, and you cannot mow it effectively with a small lawn mower, but the price of a big lawn mower is too expensive. Then, renting a big lawn mower is a perfect choice in this situation. If you just mow your garden occasionally, then you will not use it often. In this situation, renting a lawn mower will help you save an amount of money, as well as the place to store and the effort to maintain it. If you are considering between some brands or types of lawn mowers, and you still cannot decide to buy which one, just rent each of them to use and experience. It will help you understand more about them. Thereby you can make a better decision.  Finally, if you just want to save money for other activities, then, renting a lawn mower will help you save a significant amount of money, and you can use it for other purposes. 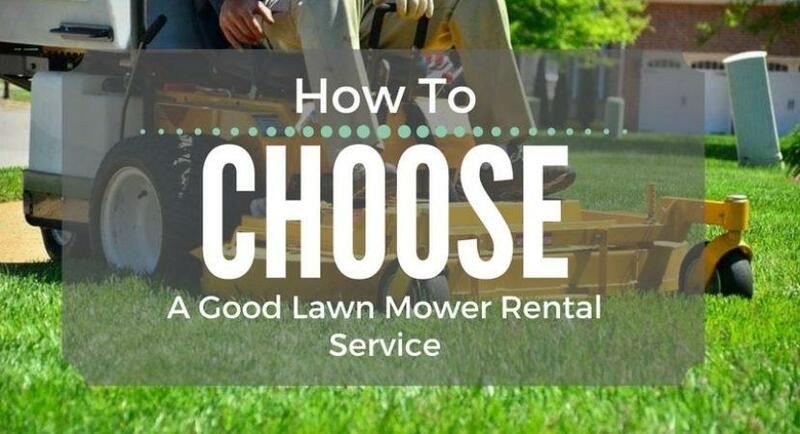 After deciding to rent a lawn mower, you should choose a lawn mower rental service. This step is not simple, and if you have not had previous experience, you may feel confused in this step. But, do not worry. In this article, we would like to introduce you to some useful steps to choose a good lawn mower rental service. Just follow each step below. You only can choose a suitable lawn mower to rent when you can identify your needs clearly. I am talking about the type and capacity of lawn mower that you choose. For example, if you have a small yard, then a push mower with small capacity will be the most effective choice. But if you have a large yard, a riding lawn mower with a big capacity may be better. So, the key factor is: clearly identify your demand and choose the suitable type of lawn mower to satisfy it. Currently in the market, there are too many types of lawn mower, with various capacities and functions, for example: riding lawn mower, push mower, self propelled lawn mower, push reel lawn mower…. You just need to identify your demand, and then choose a suitable one. After identifying your demand, you should choose a company that has the type of lawn mower you want and offers you a good lawn mower rental service. Nowadays, finding a lawn mower for rent is not difficult anymore because of the improvement of internet and other kinds of searching tool like Google, Bing… You just need to use Google, and search for “lawn mower rental near me” or something like “where can I rent a lawn mower”… to find the rental service companies near your location. Then, visit their website, read their information, and choose which one is the best for you. If you are living in United State of America, I have some company names to recommend to you. Please try to search for Home Depot equipment rental, Hertz equipment rental and Sunbelt equipment rental. They are well-known rental service companies, and I think you will find out your solution there. After choosing a good company to buy its services, the next step you should do is: consider the lawn mower rental prices. A good rental lawn mower should be balanced between the rental price and the capacity. In the other words, you should choose a lawn mower which can satisfy your needs, and you afford for it. Sometimes, this task is not simple because a lawn mower with high capacity may not have a low price. In this situation, you should call directly for the rental service company to bargain for the price, or ask them for another recommendation. This is the final step in the rental process. After going through all of the steps above, you absolutely can choose a suitable lawn mower for yourself. Now, you should check the rental terms on the company website carefully. These terms are very important because they can support you or annoy you during the using process. If you find out any term that makes you feel dissatisfied, do not hesitate to call directly to that company and ask whether they can adjust that term for you or not. If they cannot satisfy your demands, just find another company with better services. Finally, if you are totally satisfied with the terms and services, contact them to change the rental price and set up an appointment to sign the contract. In some companies, if you sign a long term contract or a contract with high value, you may gain the discount policy of them. Through this article, I think you may understand the benefits of renting a lawn mower, where to rent lawn mower, as well as all of the steps to find a suitable lawn mower for yourself. The last thing I would like to remind you about is the reference. Besides the information you can find on the TV or website, you should ask your friends, your family or anyone you trust who has had previous experience with lawn mower for advice. I could tell you that the information in this source is very reliable and useful. After all, I hope you will find the useful information in this article and enjoy your gardening time. Good bye!